Tenor 6.0.1 in B flat. If you wish to learn the 'art' of ringing, please contact the Tower Captain; you will be most welcome! The Great War memorial ringing. 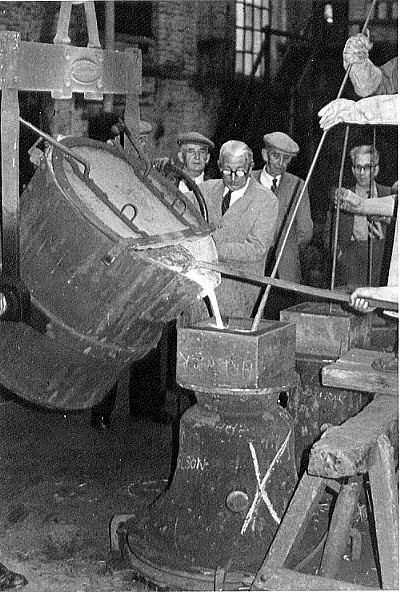 The treble bell being cast in 1965; behind the Foundry man are two Willoughby ringers - Reg Screaton & Laurence Goodacre. (ii) T. P. Dodson Vicar I. Goodacre H. Hallam Ch : Wardens 33.75" 6.0.1 B flat. The bells are hung in a cast-iron low sided frame for six bells by Taylors in 1939, with cast-iron headstocks and ball bearings; Taylors also augmented the bells in 1965. Taylors records indicate the tenor was the 1595 bell. It weighed 4.0.17 and was 29" in diameter. The third bell, probably bell number 4 above was 27.5" in diameter.The new five left Loughborough on March 31st 1856 and were rung for the first time by the Wymeswold ringers on Friday, 16th May 1856.